Stop me if you’ve heard this one before: The road to the Super Bowl in the AFC goes through Tom Brady and Peyton Manning. Of course you have, because it’s been the logline of the AFC playoffs for virtually the past decade-and-a-half. So here we go again: Manning’s Denver Broncos, Brady’s New England Patriots, and Ben Roethlisberger’s Pittsburgh Steelers are the teams to beat, the proverbial champions of the boxing ring. The “contenders?” The Cincinnati Bengals, Kansas City Chiefs, and Houston Texans. Not that the NFC offers many surprises of its own, but at least the landscape seems a bit more promising. The Carolina Panthers and Arizona Cardinals, with one Super Bowl appearance in franchise history apiece, look every bit worthy of the top two seeds. The Washington Redskins are actually favored over the Green Bay Packers, and it’s nice to see the Minnesota Vikings, if only for a week. That leaves the Seattle Seahawks as the team to beat, and they could very well be playing in the Big Game for a third straight season. New England has a bye for the sixth straight year and 10th under Brady and Bill Belichick’s reign, with five No. 1 seeds and now five No. 2 seeds. As a No. 2 seed, the Patriots have won two Super Bowls (2001, 2004) and twice won in the divisional round before falling in the AFC Championship Game (2012, 2013). Peyton Manning is 11-13 in his postseason career, the most losses of any quarterback in NFL history, and he is 2-3 with Denver. For all of his well-documented struggles against the Patriots, he is 2-2 against them in the playoffs, but 0-1 against the Steelers, who very well could be Denver’s divisional round foe. 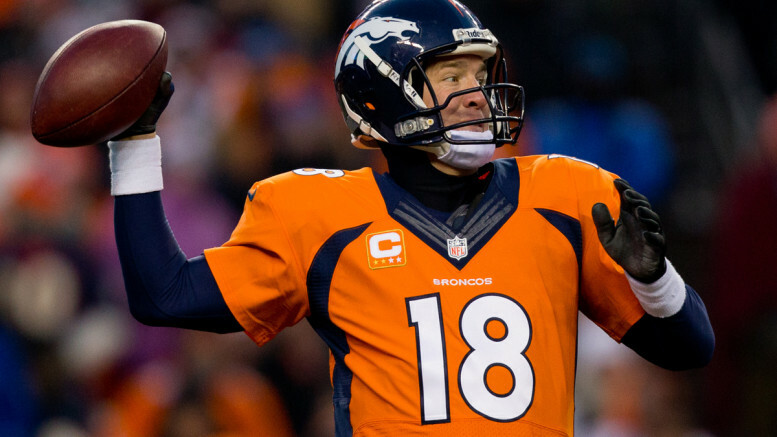 With Manning’s Colts waiting for the Steelers, the red-hot No. 6 seed went into Cincinnati in 2005 and won a wild card game, 31-17. Many elements surrounding this game are eerily familiar, like the Bengals having to rely on a backup QB in AJ McCarron with Andy Dalton sidelined. In 2005, Carson Palmer’s knee was shredded on the game’s first passing play, forcing Cincy to turn to Jon Kitna. Like in 2005, the teams split the regular-season series this season, with the road team winning both meetings. Following their win over the Bengals, the Steelers went into Indy and stunned the Colts, 21-18, en route to winning Super Bowl XL. The Carolina Panthers sure hope not, but history seems to work against 15-1 clubs. There have only been five (including Carolina) all time, but the last three have all fallen short of Super Sunday. The 1998 Vikings, who scored a then-record 556 points, were shocked in the NFC Championship Game by the Atlanta Falcons in overtime, 30-27. The 2004 Steelers, with rookie Roethlisberger leading the way, were manhandled by the Patriots in the AFC title game, 41-27. And the 2011 Packers became the first team to win at least 15 games without winning a playoff game when they lost at home to the eventual-champion New York Giants, 37-20. For most of the 2000s, we had been accustomed to seeing road teams and wild cards make Super Bowl runs. But the last two years have been stale and predictable, with both No. 1 seeds reaching the Super Bowl. Prior to 2013, it had only happened once in the previous 19 seasons (2009). The 2012 Baltimore Ravens were the last conference champion that played in the wild card round. Over the past four seasons, road teams have gone just 5-11 on wild card weekend. It has been even more of a struggle in the divisional round, with road teams going just 4-12. Still, since one road team has won in the divisional round each of the last four years, the last time all four home teams won on divisional weekend was 2004. The Chiefs and Bengals both need some extra bellhops for their baggage, which predates the two-decade mark. The Chiefs have lost eight straight postseason games and the Bengals have lost seven in a row, with their last wins both coming against the Houston Oilers. KC’s last playoff victory was in the 1993 divisional round, while the Bengals’ last triumph came in the 1990 wild card round. Though Cincinnati has felt the burden more recently, losing in the wild card round each of the previous four seasons, it’s the Chiefs who have seemingly suffered much harsher defeats during their dry spell. Most notably, they blew a 28-point lead on the road in Indianapolis in 2013, as Andrew Luck rallied the Colts to an improbable 45-44 win. Four of the Chiefs’ previous six losses have been at home, including three in the divisional round coming off a bye week. In a large cast of usual suspects, it is important to remember that four of the current 32 NFL franchises have still never played in a Super Bowl. The only one alive for Super Bowl 50 is arguably the one with the longest odds, the Houston Texans. But at least they are in the dance, while the Detroit Lions, Jacksonville Jaguars, and Cleveland Browns will have to wait at least one more season to have another crack at it. While the AFC has been the same old, same old every year — 11 of the past 12 AFC winners have been either the Patriots, Steelers, or Peyton Mannings — the NFC had quite a run of parity until the Seahawks spoiled the party with back-to-back George Halas trophies. From 2001-2012, 11 different teams represented the NFC in the Super Bowl, with only the Giants going twice. Of the five teams that didn’t get in on that fun, two have a shot this year, albeit with long odds of their own. The Redskins and Vikings are both at home, but will both face recent NFC powerhouses in the Packers and Seahawks, respectively. For the record, the other three teams left dry are the Dallas Cowboys, Atlanta Falcons, and the Lions. Will the Patriots finally crack? It’s been well documented that the Patriots haven’t lost three straight games since 2002. In fact, they’ve only lost two straight games on six occasions, but this is the first time since ’02 that it’s happened multiple times in a season. Though a one-and-done technically wouldn’t count as a three-game losing streak because the regular season and postseason are often separated in the record books, it would be a sight to behold if New England ends up dropping five of seven after a 10-0 start. Where does the “due” theory come in to play? The Chiefs and Bengals must feel like if anyone is “due,” it’s them. That’s hard to argue, but lest we forget that the storied Steelers have actually lost three straight playoff games themselves, which matches the Redskins for the second-longest drought among 2015 playoff teams behind KC and Cincy. Even the Texans and Vikings have only lost their last two games, as well as the Broncos. Be the first to comment on "With NFL Playoffs Looking Like Groundhog Day, a Look From a Historical Perspective"